The other day I was talking with a friend about control charts, and I wanted to share an example one of my colleagues wrote on the Minitab Blog. Looking back through the index for "control charts" reminded me just how much material we've published on this topic. One of the first things you learn in statistics is that when it comes to data, there's no one-size-fits-all approach. To get the most useful and reliable information from your analysis, you need to select the type of method that best suits the type of data you have. The same is true with control charts. While there are a few charts that are used very frequently, a wide range of options is available, and selecting the right chart can make the difference between actionable information and false (or missed) alarms. What Control Chart Should I Use? offers a brief overview of the most common charts and a discussion of how to use the Assistant to help you choose the right one for your situation. And if you're a control chart neophyte and you want more background on why we use them, check out Control Charts Show You Variation that Matters. We extol the virtues of a less commonly used chart in Beyond the "Regular Guy" Control Charts: An Ode to the EWMA Chart. In Using the Laney P' Control Chart in Minitab Software Development, Dawn Keller discusses the distinction between P' charts and their cousins, described by Tammy Serensits in P and U Charts and Limburger Cheese: A Smelly Combination. And it's good to remember that things aren't always as complicated as they seem, and sometimes a simple solution can be just as effective as a more complicated approach. See why in Take It Easy: Create a Run Chart. Many of our Minitab bloggers have talked about the process of choosing, creating, and interpreting control charts under specific conditions. 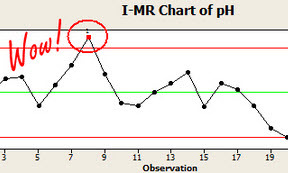 If you have data that can't be collected in subgroups, you may want to learn about How to Create and Read an I-MR Control Chart. If you do have data collected in subgroups, you'll want to understand why, when it comes to Control Charts, Subgroup Size Matters. It's often useful to look at control chart data in calendar-based increments, and taking the monthly approach is discussed in the series Creating a Chart to Compare Month-to-Month Change and Creating Charts to Compare Month-to-Month Change, part 2. If you want to see the difference your process improvements have made, check out Analyzing a Process Before and After Improvement: Historical Control Charts with Stages and Setting the Stage: Accounting for Process Changes in a Control Chart. While the basic idea of control charting is very simple, interpreting real-world control charts can be a little tricky. Be sure to check out this post about a great feature in the Assistant: The Stability Report for Control Charts in Minitab includes Example Patterns. Finally, one of our expert statistical trainers offers his suggestions about Five Ways to Make Your Control Charts More Effective. Control charts are most frequently used for quality improvement and assurance, but they can be applied to almost any situation that involves variation. My favorite example of applying the lessons of quality improvement in business to your personal life involves Bill Howell, who applied his Six Sigma expertise to the (successful) management of his diabetes. Find out how he uses Control Charts to Keep Blood Sugar in Check. Some of our bloggers have applied control charts to their personal passions, including holiday candies in Control Charts: Rational Subgrouping and Marshmallow Peeps! and bicycling in The Problem With P-Charts: Out-of-control Cycle LaneYs!. If you're into sports, see how control charts can reveal When NHL Goalies Should Get Pulled. Or look to the cosmos to consider Signal to Noise: Detecting Extraterrestrials and Special Causes. And finally, compulsive readers like myself might be interested to see how relevant control charts are to literature, too, as Cody Steele illustrates in Laney P' Charts Show How Poe Creates Intensity in "The Fall of the House of Usher." How are you using control charts?